OnLive has changed their OnLive Desktop operating system from Windows 7 to Windows Server 2008 R2 to comply with Microsoft licensing. OnLive now advertises the OnLive Desktop as a seamless Microsoft Windows desktop experience with cloud-accelerated web browsing with full Adobe Flash support. So, they left out the part about what Microsoft operating system they use. The good news is that OnLive also changed the Windows 7 on-screen keyboard to a touchscreen and tablet friendly iOS-like on-screen keyboard. The bad news is that Windows Server 2008 R2 doesn't include support for handwriting recognition and so the on-screen keyboard lost the handwriting recognition, which was very handy for many people. Windows Server 2008 R2 also lacks the great touchscreen optimizations that are part of Windows 7. As a result, the great touch optimization that made OnLive Desktop a joy to use is gone. Windows 7 made Internet Explorer, an OnLive Desktop Plus feature, work like it should on a tablet, with finger scrolling and pinch zooming that worked well on the iPad. That is no longer the case and tablet operation is difficult. Windows Journal from the original OnLive Desktop offering is also gone. The new OnLive Desktop based on Windows Server 2008 R2 is still functionally equivalent, with access to the full Microsoft Office suite, but the touch operation is clumsy. For a service that is accessed on an iPad or Android tablet, this makes operation harder than it was with Windows 7 running things. Speaking of Microsoft Office, OnLive still hasn't adapted the Microsoft Office ribbon interface to make it more touch friendly like CloudOn does. CloudOn is a service that also provides Microsoft Office streamed from the cloud for free and they also integrate Dropbox support for Microsoft Office in their service. You can access Dropbox on OnLive Desktop only if you subscribe to the OnLive Desktop Plus $4.99/month plan and use Internet Explorer to access it. On the other side, CloudOn still lacks the great picture quality, high frame rate, low latency and responsiveness of OnLive Desktop. Of course the big difference to CloudOn is that OnLive Desktop streams the whole Windows desktop for free to users and supports gigabit speed web browsing with Adobe Flash support through Internet Explorer in OnLive Desktop Plus. In the future OnLive also plans to offer support for installation of custom applications from users in the OnLive Desktop Pro plan and higher. Since the move to Windows Server 2008 R2, OnLive Desktop also no longer streams via Windows Media Player links to video files. In the past you could click the link and the video would start playing immediately in Windows Media Player. That was excellent as you could watch movies and videos without having to download them first. That way you were also not limited by the 100 MB file size limitation that OnLive Desktop currently has and you were able to watch 1-2 GB movies with no issues. Though this might not be caused by the switch to Windows Server 2008 R2, but by OnLive closing a loophole in their file size limitation or functionality. OnLive is usualy pretty fast and creative in fixing problems with their services. I'm sure they are already working hard on fixing these problems and roll out the fixes to their OnLive Desktop service. OnLive themselves said that they're steadily improving OnLive Desktop at all levels. Some of the changes are visible (e.g. they rolled out a much-improved on-screen keyboard), and some are behind the scenes and would only be picked up by technical people. These have all been in the works for a long time, and it looks like the only reason a change was noticed was because of the keyboard, but there have been many updates since launch. 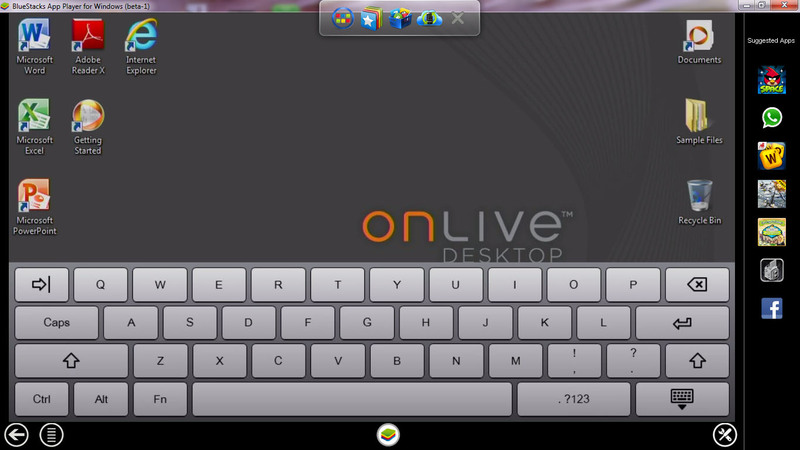 You can give the free OnLive Desktop App for iPad and the free OnLive Desktop App for Android a try.